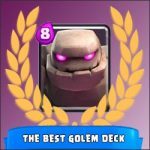 Arena 9 great Golem deck | Clash Royale fan-site! 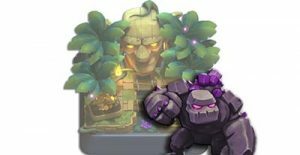 Home » BLOG » Arena 9: Great deck for Golem! Golem (epic card). 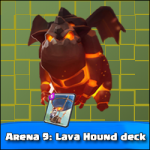 This is the basic card in the deck, the main task of which is to damage opponent’s towers and attract the attention of all enemy troops. Witch (epic card). The main task of this unit is to cover Golem during his way to the target. Witch suits this aim better than, for example, Wizard (popular card also) due to the next reasons: an ability to deploy skeletons and better effect in case of cloning. 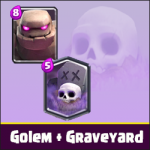 Despite low hitpoints, Witch’s skeletons are very helpful in case when opponent tries to stop Golem with such cards as Mini P.E.K.K.A., Prince, etc. Baby Dragon (epic card). This card has the same role as witch has. One more thing, Baby Dragon does it better than Minions due to higher hitpoints. Princess (legendary card). Due to long range of shoot and low elixir cost, the Princess is very useful both in attack and in defense. Skeleton Army (epic card). For defense mostly. However, this card can be very useful in attack if to use it in appropriate time in pair with Clone (more below). Archers (common card). For defense mostly. Tornado (epic card). Very useful card as in defense so in attack. With the help of tornado, we can gather all enemy troop in one tight place and provide an opportunity for our Witch or Baby Dragon to damage all enemy troops simultaneously. Tactic tips or how to play with such deck. Standard way – using Golem as a tank card. The most important thing here is to protect the monster during his way. I recommend deploying Golem only in case when elixir stock is full. In other case, there is a chance to miss a quick attack from the opponent. Note: The best place for Golem deploying is the lowest part of arena – near the King’s Tower (except of last minute of the battle). In such case when he reaches the bridge, we will have enough of elixir to deploy other troop for Golem protection. Use a “Skeleton party” tactic. The main idea of this tactic lies in a fast attack with huge crowd of skeletons (Skeleton Army+Clone) in the moment the opponent has spent all his elixir for Golem eliminating. Note: such attack must be done on the opposite flank (for example, when Golem moves by the left side, deploy skeletons on the right). That’s all! 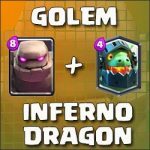 It was brief review of the decent Golem deck for Arena 9 in Clash Royale! 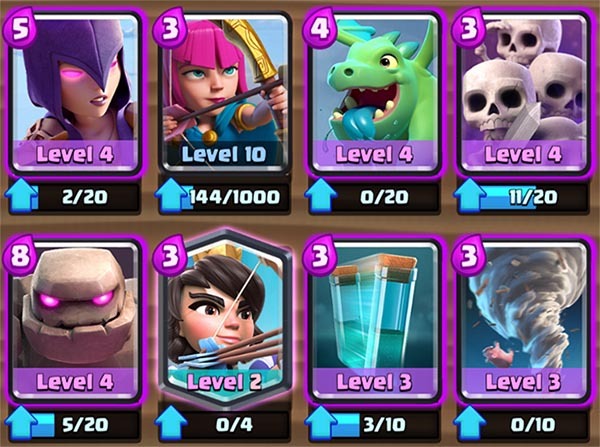 With the help of this deck, I’ve gathered more than 3k trophies and promoted to the 10th arena. Tagged Arena 9, Decks, Golem.